This is a small project to cut the heat loss through our sliding glass door. The project consists of installing a one inch thick R-Board rigid insulation board panel just inside of the fixed panel on the sliding glass door. The new insulation board panel sits against the Vinyl frame of the sliding glass door, and the allows the sliding panel slide by it easily. We intend to install this panel in the winter and remove it in the summer -- it only takes a moment to take the panel in or out. It cuts the heat loss for the sliding glass door nearly in half, and saves about $40 of fuel and 200 lbs of greenhouse gas per year. 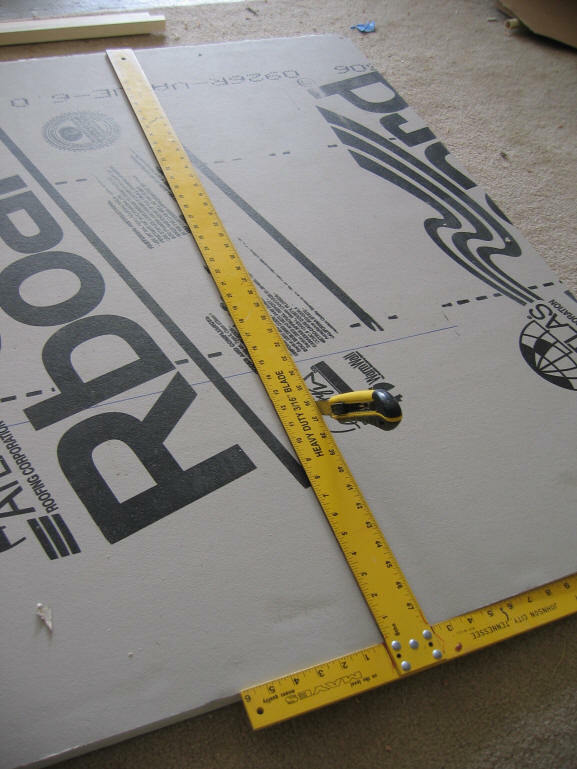 R-Board is one brand of polyisocyanurate rigid insulation board made by Atlas. There are a number of brands of this type of insulation. The R-Board works nicely because it has a fairly smooth and attractive face sheets that are also fairly durable and more resistant to fire that the bare insulation (but see warning below). 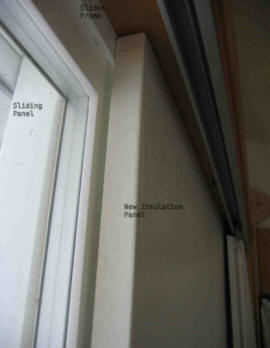 The new insulating panel installed just inside the fixed side of the sliding glass door. The sliding panel (on the left) slides behind the new insulation panel. The insulation panel is 1 inch thick polyisocyanurate edged with wood strips and painted -- it adds about R7 to the existing windows R2. Have a look at the frame on your slider, and try to find a flat surface that the new insulation panel can seal against, and still allow the sliding part of the door operate. On ours the vinyl frame provided this surface nicely. 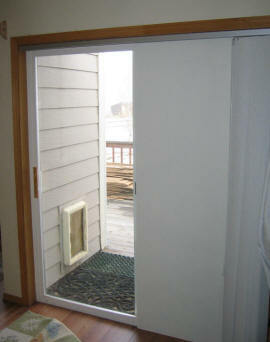 This shows how the insulation panel fits against the Vinyl frame of the sliding glass door. The sliding part of the door (left) slides behind the new insulation panel. Weather stripping (not yet installed on this picture) seals the vertical gap between the slider frame and the insulation panel when the slider is closed. Once you have decided where panel is going to go, carefully measure the size of the panel, allowing some clearance to be able to get the panel in and out easily. I edged the panel with wood strips to make the panel more rigid, make it easier to handle without damage, increase the fire resistance of the edges, and to make it look better. If you are going to use wood edge strips, then subtract the width of these strips when cutting out the insulation panel. Cut the insulation panel out. It cuts easily with a long blade razor blade knife as shown below. Use a straight edge to guide the knife, and do the cut in two or 3 passes, cutting a little deeper on each pass. After the panel is cut to size, glue on the wood edge strips. 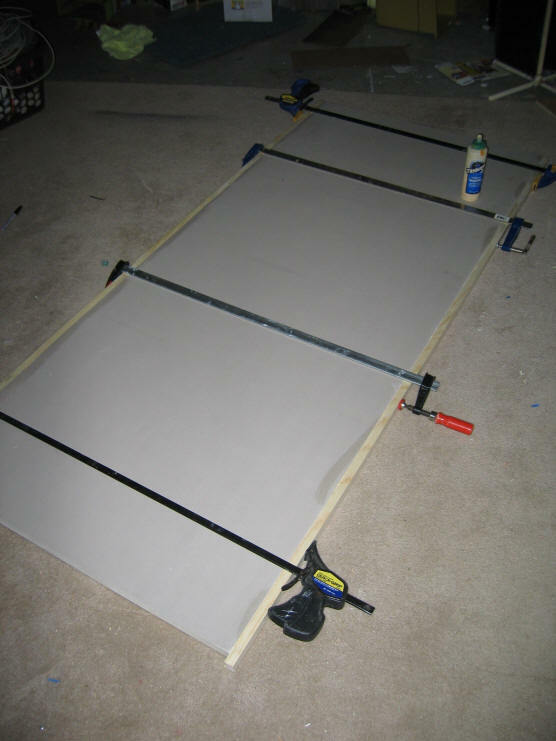 Apply glue to both the foam board and the wood strip. The foam board absorbs some glue, so use a fairly liberal coating. Clamp the edge strips in place, and wipe off any excess glue. If you don't have the clamps, you can tack the edge strips in place with 2 inch finish nails, and then turn the panel on edge and apply a little weight to the top edge until the glue dries. Or, you could use a contact cement that does not require clamping. After the glue dries, sand off any rough edges and give the panel a coat of latex paint. After the paint has dried, install the panel in place and secure it. I used 4 dry wall screws that were just long enough to through the insulation panel, and into the door frame, but not so long as to interfere with operation of the slider. While we had intended to install the panel in the winter, and remove it in the summer, we just left it up for the summer. The siding glass door works fine with the panel in place, and it lets in plenty of light with or without the panel. But, its easy to remove for the summer if you want to. So, make your own judgment on whether you want to use this material. 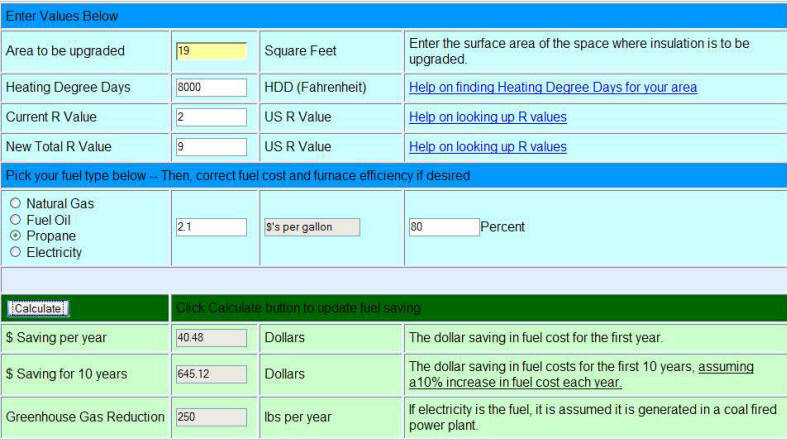 I used the Insulation Upgrade Calculator to estimate the saving in heating fuel and in green house gases. The first year fuel saving is $40, and the yearly reduction in CO2 is 250 lbs. For me, the cost was $19 for the insulation panel plus some scrap wood -- a payback period of one half year!